Easy Gourmet Recipes - Vegan Dessert No Bake Dairy Free Vegan Peaches And Cream Pie Recipe. Healthy natural recipes including breakfast recipes, appetizer recipes, soup recipes, pasta recipes, holiday recipes, party recipes, dessert recipes, gluten-free recipes, raw recipes and budget recipes. Not Just Recipes has come through again with this easy dairy-free recipe for a super yummy vegan dessert! From the no-bake crust to the creamy dairy-free filling, this no-bake vegan peach pie delivers a creamy, fruity flavor that is nothing short of sensational. Your family will ask for seconds! You can also make this vegan dessert a vegan, gluten-free recipe by using a “live” crust, such as the macadamia nut and date crust from our chocolate pie recipe. YUM! Chef’s note: there’s a lot of prep time because you’ll need to freeze the both crust and the completed pie, but you’ll only have about 30 minutes of actual work… the rest is just waiting. And as you see from the delicious photo, it will be hard to wait! 12 ounces (1 1/2 containers) of Tofutti "Better than Cream Cheese"
1. Crush the graham crackers into a fine, powdery consistency using a hand blender or coffee grinder (or buy a graham cracker crust!). 2. Add the graham cracker crumbs to a mixing bowl and add the melted EarthBalance and agave nectar. Mix thoroughly. Press firmly into a 9 inch pie pan. 3. Place crust in the freezer for at least two hours. 4. In a separate mixing bowl combine the peach flavored yogurt, the Toffuti cream cheese and the peach pieces. Use a heavy spoon or fork to completely combine the ingredients. 5. Remove the pie crust from the freezer and fill with the yogurt-Toffuti filling. 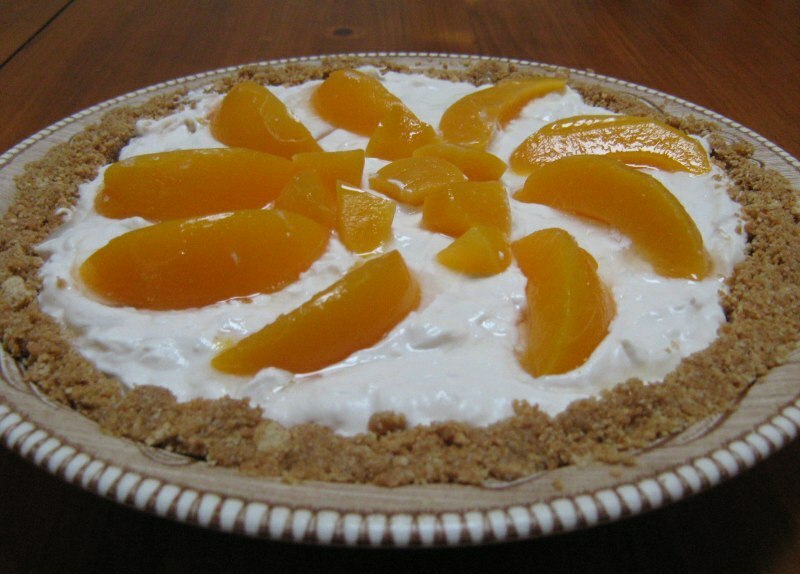 Decorate the top with the ten peach slices and return the pie to the freezer. After about two hours place it in the refrigerator to keep until you are ready to serve. 6. Remove from the fridge and allow to sit at room temperature for 20 to 30 minutes before serving.